Jonah Hill wears Carrera sunglasses in the movie War Dogs (2016). It is probably (not confirmed yet) the Carrear Safari model. These are similar but not the same as the Gucci 1622/S sunglasses that Jonah Hill wears in the same film. The Carrera Safari aviators in the film have a Havana or Dark Havana (brown tortoise) frame and gold colored arms. The Safari model is not produced anymore, so you need to look on eBay or Amazon to find the exact same model. Note that there is a model with Havana Striped frame, which is slightly different than the standard Havana frame. Similar models are the Carrera Endurance or the Carrera Champion. 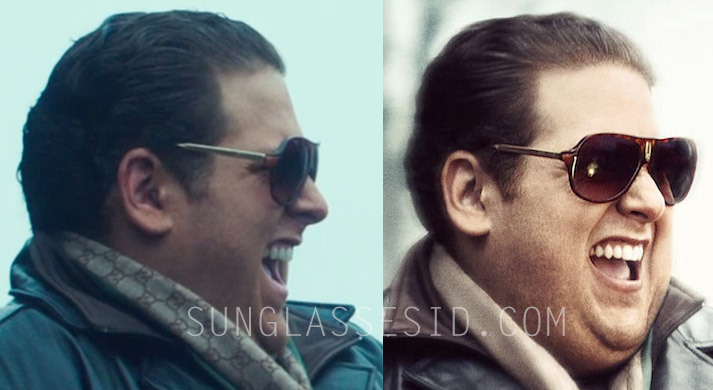 In the same film, Jonah Hill also wears a pair of Gucci 1622/S sunglasses, and another pair of black sunglasses and a pair of Aviator sunglasses.